Today, more and more businesses are migrating their products from a purchase-based to a subscription-based model. Ever since Salesforce.com pioneered software as a service (SaaS), companies across industry sectors—B2B and B2C alike—have made the move. In the entertainment business, Netflix ushered in monthly-DVD and online-streaming subscriptions, and Spotify supplanted iTunes. Even the everyday razor has been transformed from a one-shot transaction to a monthly plan, with Dollar Shave Club. Welcome to the subscription economy. For business leaders, this move raises a raft of challenges, which boil down to this: How do you get an accurate reading of the business? Selling through subscriptions is, after all, fundamentally different from selling on a pay-up-front basis. It shifts the value from transactional event to lasting relationship; indeed, the lion’s share of the value is generated after the initial sale. For example, we’ve observed that for a customer lifetime of five years, a company went from earning 60% of the customer value in the first year to earning more than 90% in the subsequent four years. Otherwise stated, the subscription model flips the risk from the customer (in the form of adoption risk) to the vendor (as customer retention risk). An investment today presupposes a longer-term client relationship—and a longer-term profit stream. How do we measure the true, sustainable health of our subscription business? How do we identify the biggest improvement levers? Should we zero in on pricing or product and market fit? Bolster sales force effectiveness? Refine our go-to-market strategy? Or take any one of dozens of operational actions? How can we know when to invest in growth and when to focus on profit taking? How do we determine where to invest across our portfolio of subscription businesses? To answer those questions, many adherents of the new subscription model use the ratio LTV/CAC: lifetime value of the customer divided by the customer acquisition cost. Through our work with clients, along with our extensive research, in-depth interviews with competitors and investors, and benchmarking analysis, we’ve seen time and time again that LTV/CAC can yield powerful insights into the health of a subscription business. Before we describe the many business-critical questions that the LTV/CAC ratio helps answer, let’s begin with a definition. (See the box below.) It is a simplified version of the LTV/CAC ratio, designed to illustrate the different components of LTV and CAC. Gross Margin: The margin based on the revenue left over after accounting for the cost of serving customers—for example, the cost of operations, support, or customer success programs. Retention: The annual revenue retained from current subscriptions; the inverse of churn. Expansion: Any additional annual revenue earned from the current customer base through volume growth, cross-selling, or upselling. Customer acquisition cost is a more straightforward metric. It represents the average marketing and sales costs incurred in acquiring a new account. Through our client work and research, we’ve discovered that some of the most common methods for calculating LTV don’t accurately reflect a company’s business performance. In our view, defining lifetime customer value is part science and part art. First, the science. An accurate LTV calculation—and one that provides actionable insights—depends on actual and specific data. A company must closely scrutinize its customer base, starting with a look at the revenue over time of individual customers within existing cohorts. The individual revenue streams will provide ARPA, as well as retention and expansion rates, of a cohort—and, together with the gross margin, allow for an accurate calculation of LTV. In our practice, we developed an LTV calculation that is different from the most commonly used ones. Our variation makes the process of determining an accurate LTV/CAC ratio repeatable. 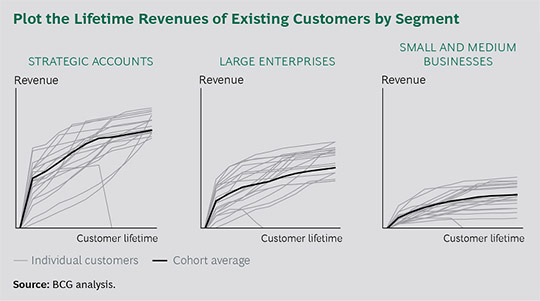 To identify the most effective levers for optimizing results, companies should determine LTV by customer segment. To do this, they must look at the individual revenue streams by segment. (See the exhibit below.) Companies should also take the same segment-by-segment approach in designing their go-to-market model and defining appropriate customer acquisition costs. We believe that LTV/CAC is the key metric for any subscription business. In our view, it provides clear answers to the most consequential questions that a subscription business faces. LTV/CAC reveals the true health of a subscription business. At its core, a growing subscription business is investing in acquiring customers in return for the promise of long-term profits. The LTV/CAC ratio answers the question, Is the return worth the investment? As a rule of thumb, venture capitalists see a ratio of 3 or higher as indicative of a healthy business. Some vendors consider a ratio of below 3 as a signal that a business needs fixing, whether in the offering itself, in how customers are onboarded, in how the offering is sold or supported, or in some other aspect. Many capabilities along the entire customer journey can promote high LTV/CAC. For a growing business, LTV/CAC helps pinpoint weak spots and prioritize operational improvements. LTV/CAC serves as a diagnostic tool that helps vendors understand where to focus their attention to optimize their businesses. The metric allows leaders to drill down, looking at the component measures and determining which ones lag their peers and which ones represent advantages worth building on. In addition to benchmarking the business against other high-performing, externally owned subscription businesses, leaders can gain important insights by comparing the LTV/CAC of different segments within their company—defined, for example, by product, customer size, industry, or marketing channel. Then, when it’s time to assess operational improvements, leaders can estimate their impact on the LTV/CAC ratio. This exercise thus helps leaders prioritize the actions that will have the greatest impact on long-term business health. For a mature business, LTV/CAC guides the decision about whether to invest in growth or run the business for profit. We’ve modeled discounted cash flows to test venture capitalists’ “3 plus” rule of thumb. Assuming typical nonoperating expenses and discount rates, we found that it is indeed reliable. In most scenarios with an LTV/CAC ratio of 3 or higher, investing an incremental dollar in acquiring new customers has a greater expected return than retaining that dollar as profit. With a ratio of below 3, retaining the profit is the better use of that dollar. For a vendor, that means a business with a ratio of 3 or higher is healthy and worth scaling with sales and marketing investment. With a ratio of below 3, the business needs fixing or should be run for profit rather than growth. For the investor, the LTV/CAC ratio offers a clear insight: businesses with some of the highest LTV/CAC ratios also have the highest price-to-revenue ratios. LTV/CAC helps prioritize investment across a portfolio. LTV/CAC is a normalized metric that allows comparisons between any subscription businesses, whether online businesses selling to consumers or enterprise SaaS businesses selling to corporate clients. For investors and for companies with portfolios of subscription businesses—no matter how diverse—a higher LTV/CAC ratio indicates which businesses are most deserving of incremental investment. Consider the experience of HubSpot, the inbound marketing and sales platform provider. Several years ago, HubSpot’s growth plan called for significant investments in customer acquisition. At the time, senior leaders determined the LTV/CAC ratio to be 1.7—a value indicating that the company needed to get its business in shape before focusing on investing in growth. Leaders applied the LTV/CAC ratio by diagnosing each of its components, customer segment by customer segment. This granular analysis allowed them to identify when and where to adjust expenditures. According to Mark Roberge, a coauthor of this article and at the time senior vice president of worldwide sales and services for HubSpot, the ratio also helped pinpoint the areas of the business that were most in need of improvement. Leaders discovered that the company’s go-to-market approach was uneconomical and that HubSpot was suffering from a high churn rate. Drilling down further, leaders determined that the churn rate was caused by sales force activities and incentives, rather than by postsales activities, such as customer success programs. That, claims Roberge, was quite a surprise. The results of HubSpot’s LTV/CAC-guided initiatives were impressive. In less than 18 months, the company cut its monthly churn rate by more than half (from 3.5% to 1.5%), reduced go-to-market costs, and nearly tripled its LTV/CAC ratio. This set the stage for the strong growth period that followed. From that point on, according to Roberge, leaders were constantly looking at different ways to optimize both LTV and CAC. Today, in his new roles, Roberge relies on LTV/CAC as his go-to metric for tracking and evaluating subscription businesses. The ratio does double duty, helping to guide strategic choices as well as operational decisions. In short, the LTV/CAC ratio is a powerful and versatile diagnostic tool. It not only provides a clear view of a product’s or business’s financial health and value creation, but it also can guide decision making. It has changed the way many leading companies evaluate and develop their offerings, take them to market, and manage their entire portfolio. For those running—or investing in—a subscription business, LTV/CAC is the most critical measure to track.